Back in '09 I decided to experiment with manual car card operations instead of the computerized Ship-it switch lists we had been using during our Wednesday night operating sessions on my former Utopia Northern Railway. It quickly became apparent that we were short of staging tracks to act as destinations "off-the-layout" for staging trains. 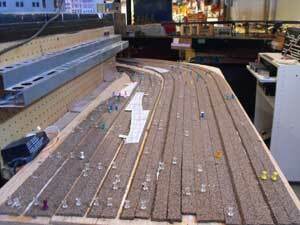 The yard and staging tracks at Underhill North were hidden beneath North Point and there wasn't a lot of headroom. This made it difficult to locate and move cars. Additional track at Underhill North had partly alleviated the problem, but a better solution was needed. I didn't have a lot of options because I wanted open staging tracks to make it easier for the operators. The answer was to give up the surface of my general purpose workbench. This workbench anchored the peninsula on which South Point and North Point were located. Now that the major benchwork had been done and I didn't have major work on the house ahead of me, I figured I could sacrifice this 30-inch by 4-foot surface.I moved the tools to my rolling cabinet. 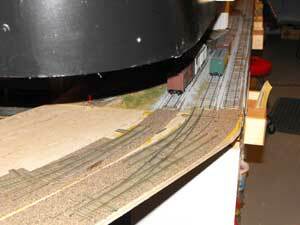 I used my modelling workbench as a substitute when necessary or I could build a platform above the tracks. The new staging area was an extension of the Fort Eerie "fiddle tracks" at the end of Underhill North. This still left a problem at Endaline, but storage drawers were used for overloads. The set-up now allowed for bridge traffic across the Utopia Northern as well as locals and through trains. On this version of my Utopia Northern HO layout the average length of trains was held to 12 cars. Southbound trains that are descending the grades to Underhill North could take more tonnage. The ruling grade from Underhill North to Colling's Woods Tower limited the number of cars unless front-end helpers and rear-end pushers were added to the train. If there were still too many cars on the railroad, then cars were moved to the storage shelves and rotated back onto the railroad via the captive coal or general merchandise freight train that operated in opposite directions from main tracks #2 and #3 between Underhill North and Underhill South. Track #1 was always kept open. Track #4 (the inside track) was normally used as a reverse loop although it could also pass trains through to Underhill North from Underhill South. If this all sounds a little complicated, it was! As of April '09 we had yet to test out the traffic flow. On paper, it did seem that the computerized switchlists were not moving many of the cars due to the lack of staging, train length, and possibly due to overcrowding of the layout. Another possible solution was to arbitrarily rationalize and group freight cars by era, that is, separate modern cars from older cars. A simple cut-off might be cars with roofwalks compared to those without. Or take some arbitrary time-points such as the introduction of covered hoppers for grain or the introduction of specific locomotive types. We weren't sure what to do with the fast clock yet. We used it initially as a static clock and released one major train from staging on each hour. This allowed us to experiment with working the local yards and industries first so that cars could be blocked preparatory to trains arriving from staging. This was the completed Open staging at Fort Eerie. It ended at a wharf and a ferry slip with a barge for "off-the-layout" destinations. An industrial backdrop was added with some building flats for freight car destinations so it actually combined some on-layout operations along with the staging. Cars were sent to the ferry, the backdrop industries or to fictitious industries. Cars for those fictitious industries could be put on any of the staging tracks. 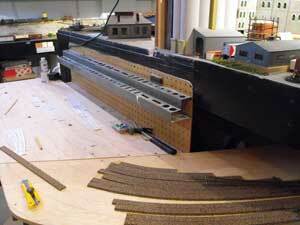 John Houghton's layout has staging tracks arranged to accept certain types of freight cars. That is another way of handling a staging area. His area for staging trains is also "open". I prefer open staging to hidden staging but this is often a matter of how much room you have. Using drawers makes this a "fiddle yard". Bill Payne's layout features a ferry slip where he can store cars on removable barges that can be stacked on shelves in a rolling transport cabinet. If you are really fortunate you can put all your staging in another room. I don't have that luxury. There are lots of alternatives for staging trains that makes a layout more interesting to operate and provides a place for all that rolling stock without crowding the model railroad. We gained a lot of operating experience with this layout. It taught me to think about operations before laying out the track. I have also gained a lot of experience as an operator on John Houghton's N scale layout and at Al Crisp's and operating sessions on layouts in the Milwaukee area during Trainfest. I'm trying to keep all I've learned in mind as I build the new Utopia Northern in a new home. You can follow along as construction proceeds. Most of the turnouts are being hand-laid using Fast Track jigs and templates. My general observations about handlaying turnouts is on a separate page that you can reach using the link below. Add my website to your RSS feeds if you're interested in learning how we make out in the months ahead. Go from "staging-trains" to the handlaying turnouts for the open staging yard. Return from "staging-trains" to my Home Page.